THE STORY OF OUR LADY OF GUADALUPE On December 9, 1531, in Mexico, Our Lady appeared to Juan Diego, a poor humble Aztec Indian who had recently converted to the Catholic faith. She asked him to go to the Bishop and tell him to build a church where she said “I will show and offer all of my love, my compassion, my help and my protection to my people.” Juan Diego did as she asked, but the Bishop asked for a sign that this message was really from Our Lady. Mary granted his request. On December 12, she showed Juan where the most beautiful Castilian roses were and told him to gather them. It was a miracle that the roses were there and in bloom because there was frost on the ground, and the ground was an infertile place where only cactus and thistles grew. After he gathered them, she helped arrange them in his tilma, or poncho, and told him to show them to the Bishop. When he brought them to the Bishop, the Bishop was amazed at the roses, but was even more amazed at what began to happen to Juan Diego’s tilma. Right before their very eyes, the image of Our Lady began to form on the cloth. The picture of Mary was beautiful and the Bishop fell to his knees. He had the church built at her request. The tilma is still intact after 470 years. The colors have not faded and the cloth has not deteriorated. It has been on display in the Basilica of Our Lady of Guadalupe for all this time. The manner in which Our Lady appeared on the tilma was very significant to the Aztec Indians. God had her dressed in a way that they would understand who she was. She was dressed in royal clothes that showed that she was very important, perhaps a queen. She also had the symbol of the cross at her neck which was the same symbol the Spaniards had on their ships and in the churches they built. She had a sash tied around her waist which meant that she was with child, for this was the way the Aztec women dressed when they were pregnant. And on her beautiful dress were all sorts of designs and flowers. But there was one flower on her dress that was very significant. It had only four petals. To the Aztecs, the four petal flower was the symbol for the true God, the God above all gods. This flower was located on her abdomen, right over the place where Jesus was growing inside of her. The Aztecs immediately understood that this was the mother of the true God! 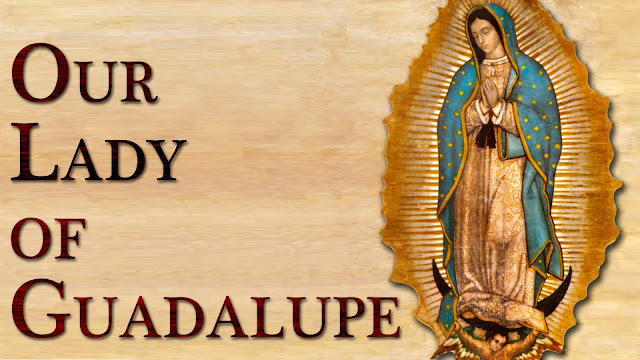 This appearance of Our Lady of Guadalupe was very important to the history of our continent. You see, the Aztec Indians and the Spaniards were on the brink of war. The Aztec Indians’ culture and religion were very different from the Spaniards. They worshipped gods, to whom they would offer human sacrifices, often killing 50,000 people a year. The Spaniards, who were Catholic, were naturally disgusted by this. But they were cruel to the Aztecs too, treating them like animals and sometimes killing them for no reason. If a war had occurred, it would have been very brutal and the Spaniards and Christianity would have been totally wiped out. Mary’s appearance changed everything, however. It helped the Indians to embrace Christianity and it helped the Spaniards to treat the Indians with respect and as human beings. In the course of seven years, 6,000,000 Indians converted to the Catholic faith. This was the biggest conversion in the history of the Church! This is why Our Lady of Guadalupe is the Patroness of the Americas. Juan Diego, the humble man to whom she appeared, was canonized in the summer of 2002. Mary’s appearance also put an end to the worship of stone gods and the ritual of human sacrifice. We pray for Mary’s help today to bring an end to the human sacrifice of God’s children through abortion and to convert non-believers. Our Lady of Guadalupe is also called the Patroness of the Unborn.